What Are The Reasons For Getting On Match? The Match List or TMF is a list created by MasterCard, which contains a database of all merchant accounts that have been terminated within the last five years due to a variety of reasons. 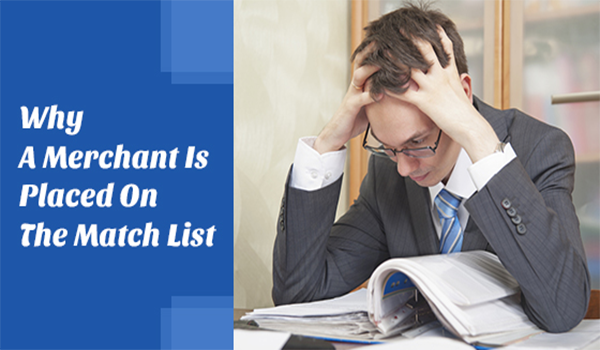 Being on the Match List is not somewhere that a merchant wants to be, as it can make it incredibly difficult to form future business relationships with other financial institutions and access lines of credit and be approved for further merchant accounts. Below are some of the reasons that a merchant might end up on the Match List. Excessive chargebacks. This is the most common reason for a merchant to be listed on the Match List. Merchants who go over predetermined chargeback thresholds often end up with their merchant agreements cancelled. Account data compromise. This means that a client’s data was stolen from the merchant holding the account and used on another account. Reasons for data compromises include breaches due to inadequate or broken security measures and potentially fraudulent behaviour on behalf of the merchant themselves. Laundering. Laundering, whether inadvertent or on purpose, can land a merchant on the list. Laundering occurs when a merchant allows a transaction to go through on a credit card that did not belong to a bona fide cardholder. Violation of standards. When a merchant is said to have violated standards, they are in violation of one or more of their card network’s compliance standards. Bankruptcy, liquidation, insolvency. If a merchant becomes bankrupt, illiquid or insolvent, and is unable to meet financial obligations to their business’ financial institution, their merchant account will be terminated and their business’ name placed on the Match List. Merchant collusion. This is when the merchant was involved in fraudulent activities with another merchant. Excessive fraud. Most merchant account agreements contain terms and conditions regarding acceptable fraud-to-sales thresholds. This is the ratio of successful, legitimate sales to fraudulent ones that the financial institution is willing to accept during the course of business. If a merchant account begins to process more fraudulent transactions than legitimate ones, their account will be placed on the Match List. The Match List, as stated earlier, is not somewhere you, as a merchant, want to be. It may mean temporarily suspending your operations if you choose to fight placement on the list or being unable to operate now or in the future. The best way to stay off of the Match List is to ensure that you are adhering to all of the terms and conditions of your merchant agreement at all times.